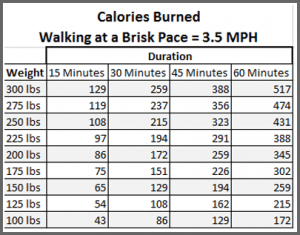 How many calories are burned walking 30,000 steps? Does it take long to walk 30,000 steps all at once? How many miles is 30,000 steps? Is walking 30,000 steps a day in achieving weight loss? I’ve paid a lot of attention to my step patterns for several months now. That, along with a few experiments, have given me a lot of insight into these questions. 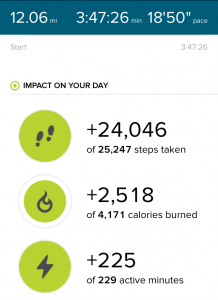 Initially when I first started using fitness trackers I picked the standard goal of walking 10,000 steps a day. There are various campaigns that promote this amount as part of an active, healthy lifestyle. After awhile of achieving this goal consistently without seeing too much change in my body or fitness level I researched it a little bit. My research taught me a few things. If I don’t make any effort to exercise or consciously try to walk throughout the day I achieve 3,000 steps or less on average. 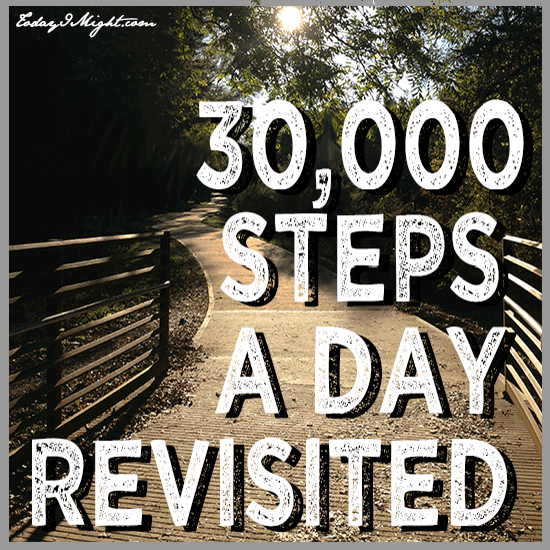 Achieving less than 3,000 steps in a day is considered inactive. So, if you have a health issue that affects you mobility, or you have a sedentary job, or you just generally spend most of the time seated you may be in this range. Achieving 10,000 steps in a day is moderately active. 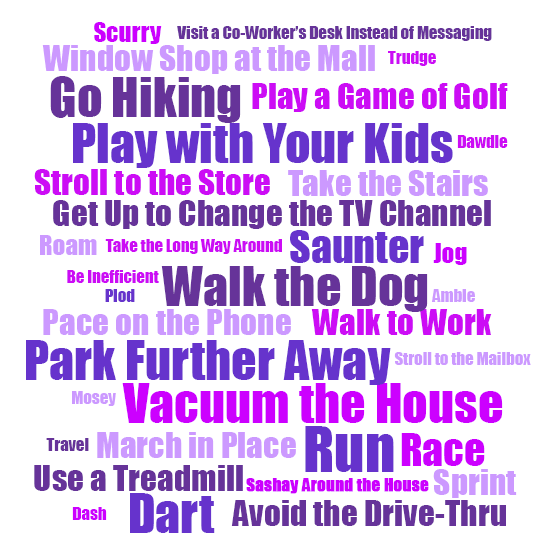 It’s a good start towards becoming more active if you are largely sedentary. If you are overweight or inactive and go from 3,000 steps a day on average to consistently achieving 10,000 steps a day it’s likely you’ll see some initial weight loss (with the same average daily nutrition). My personal experience with this goal however, is that it didn’t lead to any significant weight loss or increase in fitness level for me in the long run. It’s a good minimum to make sure I’m getting up and moving around throughout the day – which is good for my health – but not necessarily enough for me to achieve my fitness goals. Why? Because for me I just don’t burn enough calories. 1. 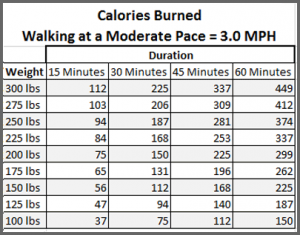 HOW MANY CALORIES ARE BURNED WALKING 30,000 STEPS? 2. How Many Miles is 30,000 steps? Ok, so this is going to vary from person to person based on the person’s height and stride length. A little digging on ‘da Internets’ told me that the average stride length is 2.5 feet. There are 5280 feet in a mile. I don’t really want to do that much math though, so that doesn’t mean much to me. 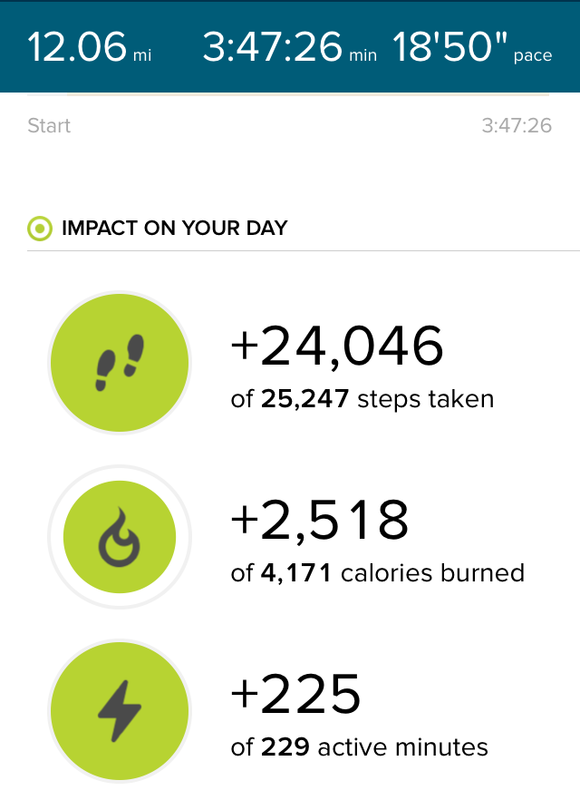 What I do know after looking at my fitness tracker day after day is that for 5’8″ me I walk about 2,000 steps per mile. So 30,000 steps is about 15 miles. I was going to walk 15 miles to verify this, but I got a little bored after 12 miles. But, the average of 2,000 steps per mile held true. 3. How Long Does It Take To Walk 30,000 Steps? Walking at an average pace, I walk about 100 steps per minute. Based on my 12 mile walk I was averaging 105 steps per minute. 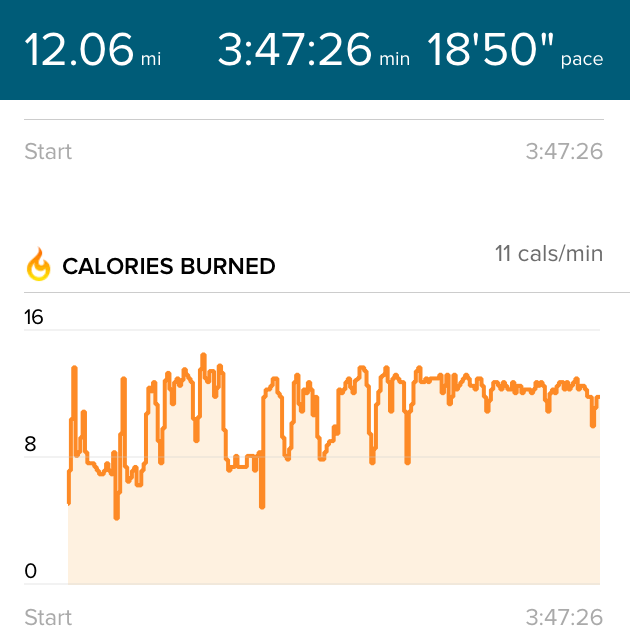 I did jog a little in the beginning then S L O W down my pace at the end. That means if you were to walk 30,000 steps all in one go it would take about 5 hours at a pace of about 3.0 MPH. 4 hours if you are athletic enough to maintain a brisk pace that long. But let me tell you, I was getting a little sore after 24,000 steps in a little over 3 1/2 hours due to the repetitiveness. It does make a difference if you spread it out over the course of the day versus attempting it all at once. Aim to walk fast enough that you are increasing your heart rate a few times throughout the day, but also balance the activity over the course of the day to avoid undue stress to your body. You don’t want to be so sore you can’t move the next day. Overdoing any workout will only lead to self-sabotaging yourself. Like any physical activity, if you build up to your goals slowly you will gradually condition your body to handle the activity, and even exceed your initial goals over time. 4. How effective is walking 30,000 steps a day in achieving weight loss? The answer? It Depends. If you currently walk 10,000 steps a day or less and then start walking 30,000 steps a day – without otherwise changing your diet – you’ll likely see some weight loss for a good while until your body adapts to the increased activity. For you, the difference might be HUGE! I would encourage anyone considering taking more steps per day to rise to the challenge. Weight loss is only one of the many possible benefits of increasing your activity levels. You may also decrease your risk of Type II Diabetes, lower your blood pressure, improve your glucose levels, reduce your risk of heart disease, and increase circulation. If weight loss is the goal I can tell you that walking/running/increasing my daily activity levels is definitely part of the formula I used to lose over 50 pounds. We tend to overestimate the calories we burn and underestimate the calories we consume. If you’re trying to lose weight by taking more steps per day then be careful about rewarding your efforts with food. A cookie could erase 3,000 steps just like that… If you’ve achieved a goal, think about rewarding yourself with non-food based treats. If you’re hoping to achieve 30,000 steps spread out throughout the day you need to be walking 1750-2000 steps every hour. Competition can help you achieve and surpass your goals – challenge a friend or family member to a steps per day contest. Momentum is your friend. Start with a walk or run in the morning to get going and push yourself towards a goal-achieving day. Setbacks happen. Don’t give up on yourself if you miss a day or two. There are always going to be days when life gets in the way. Don’t use them as an excuse to give up. You’ll likely hit a psychological wall before you reach a physical wall – don’t always believe the voice in your head. You’re capable of more than you think! Contemplate your achievements. Periodically spend time reflecting on how much easier it is to walk 30,000 steps (or whatever your daily goal is) compared to how it was a week or a month ago. Notice the changes as you become more active: how your clothes fit, how much energy you have, how you breathe more easily, how well you’re sleeping, your waist to hip ratio, improved mood, lower blood pressure, increased performance levels, better check-ups at the doctor’s office. Switch it up a little. Try a new trail every once and awhile. Invite different people to walk with you. Change your music playlist from time to time. Keep things fresh! Walking is free, accessible and doesn’t require any equipment! If you’re just getting started, think about increasing your daily steps by about 500 steps per day until you reach your desired number of steps per day. But I have to correct you on one issue. For example, today I hiked 14.2 miles and it said I burned 3,890 calories. It was true. Basically, it’s not a generic calorie count. My Gear S watch uses heart rate, speed and distance combined to determine calorie burn. Is it 100% accurate? Of course not. But, is it very close to actual calorie burn? Yes. Each person’s, body and genetic makeup determines calorie burn, but heart rate, speed and distance is still fairly accurate. 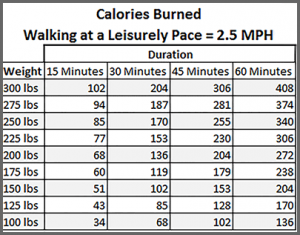 Standard walking can still put your heart rate over 160bpm, and that’s high enough of Anaerobic workout where your body burns a lot more calories as the body exerts more effort to intake proper levels of oxygen. This definitely increases the amount of calorie burn. Good point. I agree. I have not tried a Gear S watch, but I find when comparing an Apple watch, a Microsoft band and a FitBit, the FitBit always shows a higher calorie burn for a workout of the three. I like to use the more conservative calorie counts when making decisions about whether I have exercised enough and eaten an appropriate amount of calories for the day. It helps me achieve my goals better. A 14.2 mile hike is impressive! Sounds like a fun outing! Those are some impressive numbers! And kudos on the consistency! 24,000+ a day for over 3 years is quite an achievement!